1. Grasp the Lower Receiver Group and extend the bipod legs by pulling the legs down to the front, where they will lock into place. See Figure 2-5. (To retract, pull down on leg (1) and swing back into position along the receiver. If firing without using the bipod, fold them forward to preclude interference with the charging handle.) 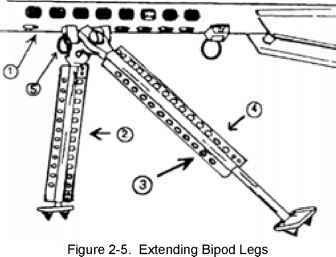 Pulling on the feet of the bipod (2) causes the legs to extend—to retract a leg, depress the plunger (3) located on the bipod leg and push on the foot (2). Place receiver on level surface. 3. 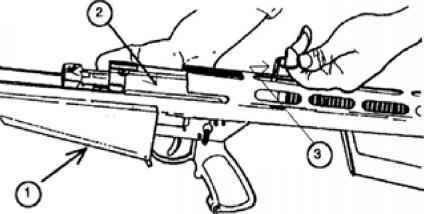 Standing above and to the rear of the lower receiver, grasp the charging handle (1), Figure 2-7, with the right hand, and carefully pull back, against tension, while withdrawing the midlock pin (2) from its retaining hole. Allow the bolt carrier (3) to come forward SLOWLY until there is no more spring tension and it rests in the lower receiver. 4. Carefully pick up the upper receiver. The barrel will be nested inside it for compact storage. Move the impact bumper rings into position on either side of the receiver's central barrel bushing, so that they rest snugly against the bushing. 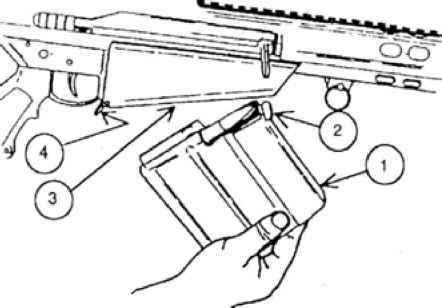 Align the barrel so that its feed-ramp (slanted entry to firing chamber) is to the bottom. Keeping fingers away from the barrel, hold the upper receiver horizontally, then tilt in the direction of the muzzle. The barrel should fall into place, at its full forward extension in the receiver. THE TENSION ON THE BARREL SPRINGS IS ABOUT 70 lbs (32 kg) SERIOUS INJURY COULD RESULT IF SPRINGS ARE SUDDENLY RELEASED. 5. 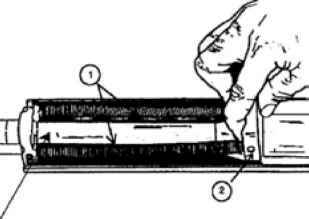 The barrel springs (1), Figure 2-8, at the front of the upper receiver, are held together by a spring yoke—the barrel key (2). Maintaining the downward tilt of the upper receiver (to keep the barrel (3) in place) firmly grasp the barrel key—not the springs—and pull it into place on the forward slot of the barrel. Work the key from side to side until it is firmly seated in the barrel slot. The upper receiver is now fully assembled. 6. 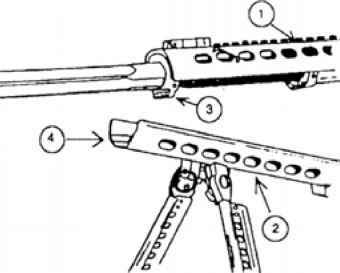 Making sure the bipod legs are extended high enough to allow sufficient ground clearance, position the upper receiver (1), Figure 2-9, rear up, muzzle down, over the lower receiver (2). BE SURE THE HOOK AND BAR ARE PROPERLY MATED, OR THE RIFLE CAN BE DAMAGED BY FINAL ASSEMBLY MOTION. 7. Engage the front hook (3), Figure 2-9, of the upper receiver over the hinge bar (4) of the lower receiver. 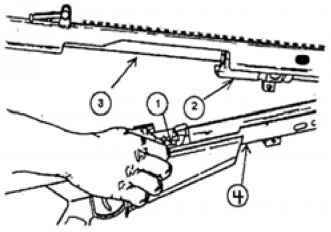 Positioned directly behind the rifle, again grasp the bolt charging handle (1), Figure 2-10, and withdraw bolt against mainspring tension so the bolt will clear the barrel (2) when the upper receiver (3) is lowered. 8. Lower and close the upper receiver (3), Figure 2-10, onto the lower receiver (4). Release the charging handle (1) slowly until bolt engages barrel (2). THE RIFLE MUST NOT BE FIRED WITHOUT BOTH THE MIDLOCK AND REAR LOCK PINS FIRMLY IN PLACE. SERIOUS INJURY OR DEATH COULD RESULT. 9. 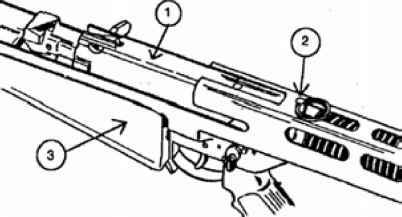 Place the midlock pin (1), Figure 2-11, through the hole near center bottom of the rifle, until it snaps fully in to lock the upper (2) and lower (3) receivers together. Insert the rear lock pin (4) from right to left through the rear (buttstock) hole to complete mating of the receivers. 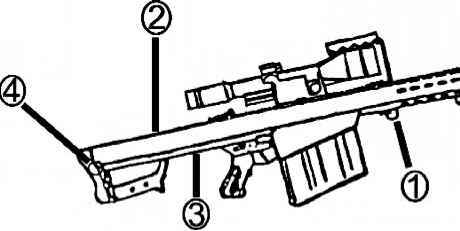 How to assemble a barrett 50 caliber?